Before I begin this article want to make the point that what I’m about to say doesn’t apply to everyone in the industry. While the average mutual fund, broker, wealth manager, and hedge fund charges high fees and delivers poor results it doesn’t apply to everyone. I know lots of good, honest hedge fund managers that charge reasonable fees. I know lots of wealth managers that act in their client’s best interest and don’t gouge them on fees. Unfortunately these are the exceptions rather than the rule. Over the past year or so, the issue of rising income inequality in the United States (and even worldwide) has come front and center. Most of what I’ve read has focused on wages, union membership, unemployment, taxation, government subsidy, and executive pay issues. There is one issue whose role I think is overlooked in the mainstream media: the role the financial sector plays in exacerbating income inequality. In fact, I believe the financial sector is one of the prime causes, and at its current point is perhaps the greatest parasite in human history. It is sucking wealth from the productive sectors of the economy at an unprecedented rate. Before we go any further, I want to define the term “income inequality.” When I use that term, I am referring to the fact that, on average, the incomes and standard of living of American workers is not keeping pace with productivity. I’m also using the term, in part, to explain why workers and executives in some parts of the economy are overpaid in relation to the benefits they provide. What I am not doing is making a blanket statement that money should be taken away from successful, hardworking people and given or “redistributed” to the lazy. In economics, the financial sector is typically lumped in with the insurance sector and real estate (the financial portion of the real estate sector, not construction) sector. Together, the sectors are often abbreviated and called the FIRE sector. In this article I will talk mainly about the finance portion of the FIRE sector since it is by far the largest, most visible, and most corrupt. The problem is that the financial, insurance, and real estate (FIRE) sectors do not actually produce any goods or services. If you go on Google Finance you’ll see it divides the economy into ten sectors: energy, basic materials, industrials, cyclical consumer goods, non-cyclical consumer goods, financials, healthcare, technology, telecommunications, and utilities. The nine nonfinancial sectors all produce goods or services. For example, the energy sector companies drill for our oil and refine it into gasoline (e.g., ExxonMobil); the basic materials sector mines our iron (BHP Billiton) and refines it into steel (Nucor); the industrial sector produces the mining equipment (Caterpillar) used by the previously mentioned sectors; the cyclical consumer goods sector produces our cars (Ford) or sells our everyday items (Wal-Mart); the non-cyclical consumer goods sector sells the things we need no matter what, such as groceries (Safeway); the healthcare sector provides the medicines that heal us (Johnson & Johnson); the technology sector gives us the computers and software we use (Apple); the telecommunications sector gives us the ability to communicate (Verizon); and the utility sector gives us the power to run our homes and businesses (Duke Energy). Those who work in banking, venture capital, and other financial firms are in charge of allocating the economy’s investment resources. They decide, in a decentralized and competitive way, which companies and industries will shrink and which will grow. The job of the finance sector is simply to manage existing resources. It creates nothing. Therefore, the smaller the financial sector is the more real wealth there is for the rest of society to enjoy. The bigger the financial sector becomes the more money it siphons off from the productive sectors. The graph below shows how the financial sector has grown since 1960. 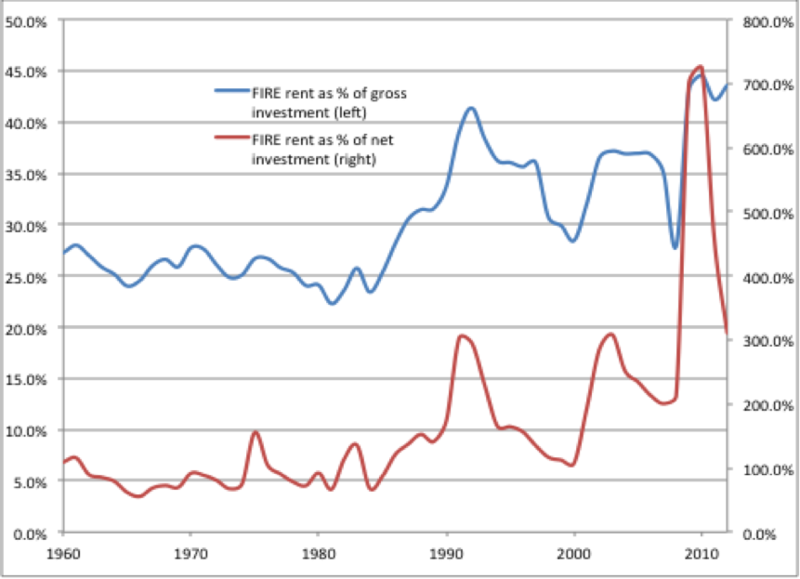 The figures are shown as a percentage of investment (using both gross and net investment). As you can see, the financial sector has almost doubled or tripled in size since 1960. That means it is extracting double or triple the amount of money from the real economy! I want to go through several areas of the economy to show you how the financial sector is extracting money and offering no benefit. I want to start with the industry I work in, wealth management. When I started my business, I was cognizant of how investors were ill served by the traditional model of wealth management and vowed to run my business differently. Unfortunately, a vast majority of the financial industry has built an unrivaled apparatus for extracting huge sums of money from retirees and mom-and-pop investors. Say, you’re sitting on your couch, watching TV and thinking about retirement. You just got part of your inheritance and think investing it for the future would be a sensible idea. Imagine you haven’t the slightest idea how to get started. Then a commercial comes on with Tommy Lee Jones telling you how trustworthy Ameriprise is. Maybe you hear the reassuring voice of John Houseman pitching Smith Barney, or you might see the iconic bull charging across the desert for Merrill Lynch. Say you decide to go down to your local brokerage and meet with a financial advisor. His (or her) pitch sounds good, so you decide to become a client. The first problem is the guy you met. Remember how he told you he has his finger on the pulse of the market, he has access to the best investment research, he is always taking continuing education classes, and he is always monitoring your portfolio? He isn’t. He could be a complete moron. He got hired (and survived and thrived) because he is a good salesman. Nothing less and nothing more. He takes his orders on what to sell from the top — the gaggle of people with their fingers in your retirement pie, helping themselves to regular bites. Neither of these two friendly fellows actually does much, if anything, in the way of actual investing. Sure, they learn the lingo, dress sharply, and probably know more than the average Joe, but they don’t call the shots. That happens at Big Bank HQ. Somewhere in the belly of the beast there is a gaggle of highly paid, largely worthless economists and market technicians. Using some combination of tea leaves, voodoo, crystal balls, and tarot cards, these guys come up with the selection of one-size-fits-most, happy-meal portfolios that clients will be invested in. Actually, scratch that. Portfolios aren’t assembled using all kinds of mystical methods; they are assembled using cold hard cash. (It’s the finance sector. Did you think they spoke a language other than green?) See, various mutual fund companies pay marketing fees and other dubiously legal payments to the advisory firms to get them to sell their funds. In 2010, mutual fund companies paid $3.5B in perfectly legal “pay to play” schemes to get their funds featured in various investment lineups. You, the investor, are usually charged somewhere around 1% to 1.5% of assets annually for this “service.” I’ve seen clients charged as much as 1.65% and I’ve come across firms advertising fees as high as 2% per year for clients with small account balances. For large portfolios (typically $1M or more) the fees start going down and I’ve seen rates as low as .5% or less. These fees are split up between your advisor, the district manager, and the firm itself. Keep in mind that these are fees before any investments have been made! 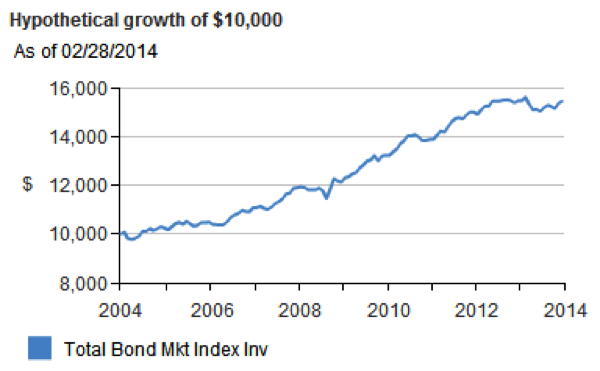 So who actually makes the investments in stocks and bonds? It’s the portfolio managers at the mutual fund companies. According to the Investment Company Institute 2011 Fact Book (the ICI is a pro-mutual fund organization), the average mutual fund in 2010 charged 1.47% of assets annually. That’s in addition to an average up-front sales charge of 1%. Why so expensive? Well, the funds are towing a lot of dead weight. According to the ICI 2013 Fact Book, only 42% of mutual fund employees were employed in fund management positions or fund administrative positions. The rest, 58%, were employed in either investor servicing (34%) or sales and distribution (24%) job functions. Like any good infomercial says, “But wait! There’s more!” When you buy a stock or bond, you can’t just go grab it off the shelf like you are shopping at Wal-Mart. You need to go through a brokerage. A 1999 study by Chalmers, Edelen, and Kadlec found that the average mutual fund incurs trading expenses of .78% per annum. A newer study in 2004 by Karceski, Livingston, and O’Neal found brokerage commissions cost funds around .38% per annum, or .58% if you account for the effect trading large blocks of stock has on the bid-ask spread. But wait! There’s more! Mutual funds and your average retail investor are relatively unsophisticated, so a new industry has popped up to take advantage of them. It’s called “high frequency trading” or HFT for short. These are powerful computers programmed to take advantage of “dumb” traders in the market. These HFT firms place their computers physically next to the stock exchange computers in the datacenters and buy access to market quotes milliseconds before they are made public. They use these and other advantages to skim profits from other legitimate investors (that is, people buying stocks because they want to own part of the underlying company). All told, it’s not uncommon to see investors incurring annual expenses of 2%, all the way up to 4% per year. The problem isn’t just limited to Joe Six-pack Retiree. Large institutional investors, such as pension funds, and “sophisticated” rich investors get taken to the cleaners too. Once upon a time someone came up with a great idea: Since an all-stock portfolio is volatile, why not “hedge” the portfolio and sell some stocks short? If you bet that good stocks will go up (buying stocks in the good companies or going long) and bad stocks will go down (selling the stock short) then you could limit volatility and maybe make some extra money. (You’d make money both when the good stocks went up and the bad stocks went down). It was and is a pretty good idea when done correctly. Unfortunately, the term “hedge fund,” like the term “mutual fund,” has lost its original meaning. The term hedge fund is now used to refer to any type of pooled investment vehicle that is limited to select clients (usually rich, sophisticated investors and institutions, although the rules vary worldwide). The rule of thumb is that hedge funds charge a 2% per year management fee and keep 20% of all profits, the proverbial “2 and 20” compensation. According to a WSJ article, this old adage isn’t too far off; the average hedge fund charges 1.6% per year and keeps 18% of profits. In 2012, hedge funds removed $50.5B from their investors’ pockets. In fact, according to an article in Jacobin Magazine, the top 25 hedge fund managers make more money than the CEOs of all S&P 500 companies combined. Combined! Have they earned it? Well, the answer seems to be no. I pulled the last four years of return data for two hedge fund indices: the Barclays Hedge Fund Index and the Credit Suisse AllHedge Index. 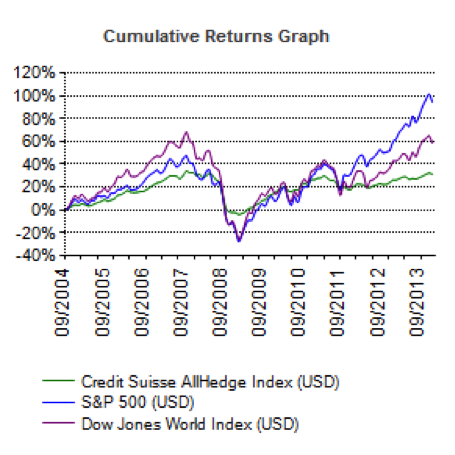 These two indices track thousands of hedge funds across the globe. I compared them with the returns of the Vanguard Total World Stock Index Fund and the Vanguard Total World Bond Market Index Fund as well as a 50/50 portfolio of the two Vanguard Funds. All returns shown are net of fees. The Vanguard stock fund trounced both hedge fund indices, and the Credit Suisse index managed only to beat the returns of bonds by .01%. Right about now you will hear the howls of the “hedgies” complaining. I wasn’t quite fair to the hedge funds. A lot, but not all, of them are hedged so returns in down markets will be better and four years isn’t a terribly long time to look at. 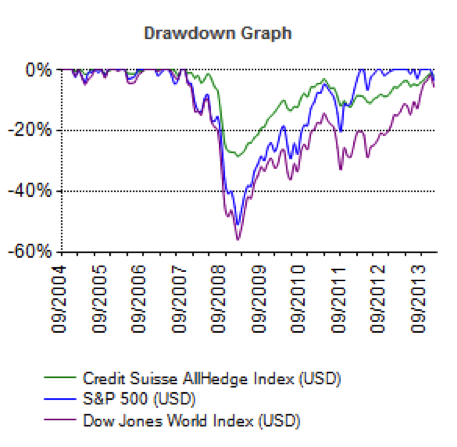 The two graphs below show the returns for the Credit Suisse index since 2004 and the maximum drawdowns (losses) since 2004. First, over 10 years the returns for hedge funds are atrocious, only about 25% in total. They do have a point that the draw downs are lower. The maximum losses experienced during the downturn only averaged about 25%. Fine, but the Vanguard Total Bond Market Index had barely any draw downs during the crisis and returned over 50% during a similar time period. Unfortunately, Vanguard does not have return data for any of its World Stock funds for a complete 2008 calendar year so I was unable to get exact data for my 50/50 portfolio. But I’d be willing to bet it beats the hedge fund indices on a risk adjusted basis. When you hear about underfunded pension plans, part of the blame lies with pension investment committees and their investments in hedge funds. These funds, in aggregate, have not earned the fees they charge and have instead funneled the money of retirees into the hands of a wealthy few. I’m not alone in reaching this conclusion. Pension funds are slowly starting to see the light and reducing their allocations to “alternative” investments, such as hedge funds, and reallocating the capital to indexed products or negotiating with the funds for lower fees. It’s not just the traditional investment arena where the financial sector has run wild. Its unending quest for siphoning money from the economy has spilled out into other areas. Speculation by the financial sector in the commodities market is impacting the entire world. The passage of the Commodities Futures Modernization Act (CFMA) has allowed big banks to engage in almost limitless speculation in the commodities market. Wall Street has convinced everyone from individual investors to pension funds and endowments that they need to include commodities in their portfolios for deworsification, I mean, diversification purposes. Between investors plowing more than $350B into the commodities market and what appears to be outright manipulation of commodities prices, the financial sector has increased the costs of everything from wheat to heating oil and aluminum to gasoline. An executive for MillerCoors testified that manipulation of the aluminum market cost manufacturers over $3B. The World Bank estimated that in 2010, 44 million people worldwide were pushed into poverty because of high food prices. The chief cause? More than 100 studies agree the cause is speculation in the commodities market. (Goldman Sachs made $440M in 2012 from food market speculation.) For Americans who love their cars (and SUVs), the biggest impact might be felt at the gas pump where experts estimate that financial speculation has added anywhere from $1 to $1.50 to gas prices. For more information on speculation in the commodities, I recommend Matt Taibbi’s excellent pieces, in-depth information at Better Markets, or some of my articles on commodities. If you think it’s bad enough that Wall Street is raising the price of your food, heating oil, gasoline, and Pepsi, then wait until you get a load of one of the Street’s other ingenious ideas for helping themselves to more of your money. One significant source of profit for the financial sector has been exploiting public, taxpayer-owned infrastructure. It should be blatantly obvious that these deals are bad for citizens, as the fees charged to citizens for use of the asset must not only cover servicing costs and maintenance capital expenditures but must also generate profit for the firms buying the assets. The first and most obvious examples of this type of fraud (I choose to use the term “fraud” because I believe that is exactly what these deals are) are government entities selling public, taxpayer-owned infrastructure, such as road, bridges, parking facilities, and ports, to the private sector so that they can extract rent from the users. The deals are usually touted as saving taxpayers money and letting the “more efficient” private sector better manage the asset. This is false. Many studies show private ownership of public goods does not lead to any cost savings. A comprehensive econometric study done in 2010 of all available public vs. private studies by Germa Bel, Xavier Fageda, Mildred E. Warner at the University of Barcelona found no cost saving in privatizing public water or solid waste management services and infrastructure. The case is no different when it comes to public roads. A 2007 paper by US PIRG found that privatizing roads never benefits citizens. Financial firms were typically able to buy the assets on the cheap and then raise toll rates while usually sneaking language into the agreements that prevented governments from building competing infrastructure. The paper presented evidence that the Indiana Toll Road lease will cost taxpayers at least $7.5B. One of the most egregious examples of the financial sector extracting rent is the 2009 sale of Chicago’s parking meters to a consortium led by Morgan Stanley. Shortly after the lease was finalized, rates at many parking meters increased (in some case by quadruple the amount). The Chicago Inspector General found that the city was underpaid by almost $1B for the lease. Meanwhile, in 2010 Morgan Stanley banked $58 million in profits from the parking meters. With no way out of the deal, the citizens of Chicago are now paying Morgan Stanley for the right to use assets they used to own! The second way in which taxpayers are exploited by the financial sector is so-called public-private partnerships (also referred to as PPP or P3). There is no set definition for what constitutes a PPP arrangement, and it is possible some might be beneficial in limited circumstances. I want to focus on one specific type of PPP that enriches the financial sector: when public projects are privately financed. There is absolutely no reason for any government project to ever require paying “rent” to the financial sector in the form of financing. The United States federal government is the monopoly supplier of US dollars. It can add them to the economy at will through deficit spending or remove them via taxation. There is no earthly reason for a public entity to be forced to depend on the private sector to provide any type of financing. The only constraint on whether or not money should be spent is whether the economy is at full capacity (full employment and full industrial capacity utilization) where the additional deficit spending may cause inflation. State and local governments are unable to issue currency and therefore must depend on revenue raised via taxation, distributions from the federal government, or money raised through bond issuance. Even then, studies have shown that PPPs are more expensive compared to the state or local entity securing financing through the municipal bond market. As the financial sector funnels more and more resources into lobbying and bribes (let’s face it, campaign contributions are nothing more than legal bribery), it has been able to strip an ever-greater amount of state-owned assets from the public. Public asset strip mining is one of the chief causes of the increasing profitability of the financial sector. So far we’ve dealt with examples that are pretty easy to see. Everyone who owns a car knows that gas prices have been rising too fast and food is more expensive. The citizens of Chicago know they are getting shafted on the parking meter deal since parking rates have quadrupled. But there are hidden areas of the economy where the financial sector is ripping off the public too. Do you know what LIBOR is? And what it’s used for? A lot of financial types read my newsletters, so I’m sure some of you do. But the average man or woman on the street likely does not. LIBOR stands for London Interbank Offered Rate and is the average interest rate banks in London estimate that they would be charged if they borrowed from other banks. This rate is used worldwide by mortgage lenders, credit card agencies, banks, and other financial institutions to set interest rates. By some estimates, more than $350T in financial products, derivatives, and contracts are tied to LIBOR. In 2012, it was discovered that, since 1991, banks were falsely inflating or deflating the interest rates they reported. (Remember banks essentially make up their own interest rates and report them with the results being essentially averaged and reported as LIBOR.) The banks did this in order to profit from trades or to make themselves look more creditworthy than they were. I highly doubt any of my clients or readers are beneficiaries of the SNAP or “food stamps” program and are probably not very familiar with it. While it is nominally a government program it has been corrupted by the big banks. Benefits are provided electronically via debit cards (EBT cards). JP Morgan has made over $500M from 2004 to 2012 providing EBT benefits to 18 states. The banks then are free to reap fees from users for such things as cash withdraws for TANF benefits, out of network ATM fees, lost card replacement fees, and even customer service calls. I believe you can judge how profitable a service is to a company how much it spends on lobbying. 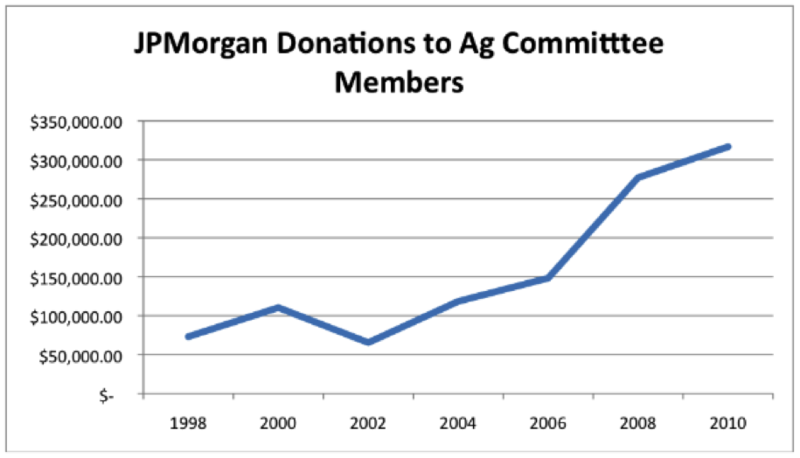 In the case of JPMorgan, its bribes, I mean campaign contributions to Agriculture Committee (SNAP is part of the Department of Agriculture) members increased sharply after it entered the EBT market in 2004. A bloated and out-of-control financial sector does not add any value to society. Society benefits when the financial sector is kept as small as possible. The financial sector is a parasite that depends on its host organism, the productive sector of the economy, to fuel its profits. The larger the financial sector grows, the more wealth it extracts from the productive sectors of the economy. With all due respect to Matt Taibbi, Goldman Sachs isn’t a vampire squid; the entire financial sector is the vampire squid with its tentacles reaching into the pockets of citizens everywhere and sucking out money. This entry was posted in Ben Strubel and tagged financial sector, retirement. Bookmark the permalink. Quite a damning critique, and if I may step away from the main point…I have to ask: why is it that some guys involved with finance, Strubel as well as Auerback, Mosler and Ritholtz, talk like this while so many in the field do not? Does everyone involved “know” all this but most simply choose to put on blinders? Great Article about the .01% “Taker Class”. This can all end by the 99% demanding a change to the TAX CODE! Yet another clear indication of the manipulation of the “Giver Class” by government! Its truly frightening to see how the public has been blindsided/mislead about the root causes of rapid income inequality. As a social worker I am somwhat familiar with the SNAP benefit program…Depressing to think JP Morgan Chase skimmed at least 500m over an eight year period for SNAP and welfare benefits. I suppose this is the new age enclosure movement where Wall Street is picking up public assets for pennies on the dollar and charging enormous rents..The questions is..what happens when it is used up?? A scorched wasteland of dysfunctional infrastruture/gated communites housing a tiny elite protected from beggars, street criminals, and gang bandits?? Excellent article. Easy for a layperson to understand and covers a good portion of the pervasive, ongoing, worldwide financial system theft. I worked for a stock brokerage firm years ago while studying for the series 7. Once I figured out they were all just well-dressed telemarketers, I quit and found a more productive job. Remember ‘dogs of the Dow’ ? A very well-written and eye-opening post – thanks, Ben. I think this formulation may be somewhat muddling the real-vs.-financial dichotomy that MMT revolves around. Sort of by definition, the financial sector is 100 percent nominal – even when it posits ownership of real assets, it is really just money-valuing them, applying the unit-of-account property of money. The ownership is an abstraction. The owner of a share of stock or a gold ETF has no concrete interaction with the company or commodity in question. So, contrasting the total size of the financial sector to the totality of real wealth available – for those members of society who do *not* receive income from the financial sector – leaves me scratching my head. I’m not clear what is being measured. I know that profits flowing to the financial sector have exploded from around two percent of total corporate profits in the 1950s to around forty percent now. This means it is over-charging for its so-called services, but I think the real-economy effects are non-linear, and more complex than this. Regarding the financial sector’s growing tendency to siphon off money from the productive sectors – yes, they do this. But it is up to the state, with its currency-issuing and taxing powers, to regulate how far this process goes and what happens next. In a recent post, J.D. Alt took note of the ephemeral nature of the financial sector’s nominal money-wealth. It is “ficticious capital”. Electronic poker chips. Just zeros and ones, really. As long as the plutocrats simply hoard them – use them to keep score – the state can just replace them by increasing spending. I also tend to think that the consumption spending of the .01 percent is rather inelastic. They already have everything they want. Keynes’ attitude was to let them live it up, up to a point, and then tax the excess back when they die. For me, the most important part of your post is the section on commodity speculation and infrastructure privatization. This truly is a huge deal, a clear interaction with the real economy and a terrible crime, actually. Again, though, it is up to the state to permit these outrages or ban them – we used to ban them but we stopped. So. One more big thank-you to the Big Dog, I guess. To think – before Clinton, America actually based aid to poor children on their ages and their poverty rather than the supposed moral imperfections of their parents. We even had no-fee food stamps. Obviously, the other reason we can’t just let the one percent play their casino games is that they eventually blow up the real economy, as a totality, through financial crises and destabilization. And, due to all the fabulist monetary propaganda out there, there is now a big reservoir of public opinion and political will *in favor* of financial collapse. The libertarians and other Paul-Partiers think it would do us all good. And bring back the gold standard. And “End the Fed”, and all the rest of that good 19th Century stuff. I’m not a ready-for-Hillary kind of guy in general, but is it possible to imagine a scarier idea than President Rand? Thanks again, Ben – great post. While most of your specific criticisms are quite valid, I think your brush is a bit too broad. This is obviously false. I have many times used services provided by banks, credit unions, insurance companies, and real estate brokers and agents. It would be practically impossible to find the right house to buy, to sell it for a fair price, to get the loan necessary to buy it, or to protect myself and my family from a catastrophic loss without their services. It is undoubtedly true that most of the volatility of the FIRE sector since 1990 is due to speculation and parasitical activities, but there is undoubtedly also some growth of useful services that has facilitated growth of the other sectors, not detracted from it. Thus it is not always true that “the smaller the financial sector is the more real wealth there is for the rest of society to enjoy”. Bottom line, you have a good point. Excessively broad statements might be more dramatic, but if they are not true they don’t help your cause. He stated that the service they provide is moving money around, basically. That doesn’t “produce” anything. There is no real value there. That’s the point. The real estate agent doesn’t make a house available to buy or sell. The buyer and the seller do that. The real estate agent inserts themselves in the middle. Banks don’t generate wealth, they redistribute it. Insurance is probably the worst offender though. That literally doesn’t produce or provide a service. Really, what has paying an insurance company protected you from? Did a fire not happen because you paid them? Was your home not destroyed in a flood? Did you not have to fight and “prove” you deserved to get any pay out that was due? You call that a service? The only service they could be said to provide is a false peace of mind. I have gotten real value from real estate brokers. Did you ever try to sell a house without one? Qualify the serious buyers and deal with the lookie-loos? And the government paperwork!! I’ve always gotten my money’s worth. No, the fire doesn’t care if you have insurance, but the insurance company will advise you on how to prevent fires and minimize the damage. Paying an insurance company has protected me from paying the unaffordably high cost of the insured risks. The service provided by insurance is not incident prevention, it is management of financial risk, and it does that very well. My claims have been handled quickly and fairly. I had one unusual case where I thought the insurance company should have paid me more than their original offer (the nation-wide blue book value of the car didn’t reflect the unique situation in my State), and after discussion they agreed with me and paid. I’ve been with them for over 40 years and I’m very happy with their services. If you want your bank to create wealth for you, you’re looking in the wrong place. Banks are good for storing and protecting your money, and many will do that for you without fees, and even pay you interest. They’ll let you use their computers to pay your creditors, also without charge. They’ll even give you short-term interest-free loans, and pay you cash rebates, if you use their credit cards. I like my banks’ services, too. And, of course, if you want to borrow money they will lend it to you and if your payment is late they don’t break your legs. They will make a profit, though. That’s why they do it. You don’t have to participate if you don’t want to. Not every bank is Goldman Sachs, and not every insurance company is AIG. Those are good examples of companies that often serve no useful purpose, but there are many others who do provide useful services at a reasonable cost. Altough I can be sympathetic of the no-value creation thesis in the financial industry, comparing the performance of hedge funds with the recent performance of bonds is a no big no-no, because it assumes a negative correlation between equities and bonds. If one look at the world markets in the last 100 years, that has been the exception rather than the rule. And you forgot to mention the important roles of capital markets in deploying capital and financing companies through IPOs, bond offers, etc. You missed another big point, negative real interest rates. The Fed Funds Rate is currently 0%-0.25%, while real inflation is much higher. (The CPI is not an accurate measure of inflation.) Big banks can profit by borrowing at 0% and buying stuff (bonds, stocks, commodities, real estate, politicians, whatever). On LIBOR, here’s another interesting bit. Cities and states lost a TON of money on interest rate swaps with banks. What was sold as a “hedge” wound up blowing up and costing a fortune. This was a fascinating piece, very readable for those of us with minimal financial education. However, since this is such a good explainer for the layman, I think it would be very beneficial to explain how big a difference 1% in fees makes for an investor over a lifetime. I know personally when I used to compare funds the difference between 1 and 2% in fees seemed negligible. But then I saw that fantastic PBS Frontline on this topic and saw how much that 1% could cost me over a lifetime! I now have everything that I personally manage in index funds! You can’t really argue with what has been said, and all (of us) involved in the sector know it is massive rip off. While a free market advocate, I think a first step would be to introduce meaningful fee caps on all state promoted or mandated saving arrangements (eg ISAS, and Pensions), on the grounds that the market is skewed by the government intervention that creates the glut of forced buyers, and so to correct that imbalance the market (i.e. consumers) need protection through fee caps. I’d say no more than 20 – 25bps should be permitted for all ISAS and pension savings (DC or DB). Individual wealthy investors (investments of more than say £5m?) can pay what they like. >>The job of the finance sector is simply to manage existing resources. It creates nothing. This is a dubious assertion, but you clearly believe it. How then, can you in good conscience, charge 1.25% (plus indirect costs for the funds you hold in client portfolios) to manage people’s money when you yourself admit you are adding no value? I know this was for Ben, but there’s a pretty simple answer to that question: They don’t charge 1.25% because they create value, they’re charging a fee to access the profit created by companies they invest in. Say I told you that I knew a guy named Jimmy who was going to make three bucks for every buck he gets, and I asked if you’d lend me a dollar to give to Jimmy with the promise that he’d give me 1.50 cents of it. I’d want to keep 25 cents but you can have 1.25, and so you agree. I didn’t create the 2 extra dollars of value — Jimmy did — but I feel justified in asking for a cut because I gave you the tip about Jimmy’s value creation ability. At least, that is my understanding of Ben’s statement. There are 6000 publicly traded companies. Some of them will have rising stock prices, some falling. If a money manager can steer you to the rising ones, he is doing something of value. It doesn’t mean he created anything physical that didn’t exist before. He’s doing a service for you that would otherwise have taken you some time and effort to do, and that’s what you pay for. Yes, it’s a different definition of value. The growth of financial services has been outpacing the growth of other sectors to a monstrous scale, and that makes this distinction important. It signals a kind of corruption that can only mean high inflation and decoupling money from economic output. I don’t follow. How is financial services different from any other kind of services, in the impact on inflation? Why not also actors, barbers, or any other service profession? The growth of the financial sector might be explained by the fact that it is the industry most able to exploit computers, and the first to do so on a large scale. The corruption is, I think, a separate issue that is present whenever other people’s money is involved. Financial services and government are simply more involved that way than most other industries, and have been all along, dating to long before the recent growth. Corruption is not impossible in any industry, just more attractive when the numbers are larger. Corruption is never a seperate in ANY corpotate activity. The TAX CODE treats the wealth of the .01% radically different than Income from Labor, because all Taxes on Capital Gains are deferred until taken and are not TAXED as ordinary income. The TAX CODE is responsible for the corruption of our government because it has put real POWER, the Power of Wealth in the hands of the .01%, to buy whatever it wants, while labor and the poor spend everything they earn or are given , every single year to survive in a economic culture designed for the benefit of the .01%, something no one will write about! Change the TAX CODE and the Corruption of Society will end! Barbers and actors being paid for their labor do not have the same impact on inflation as a bank giving out loans and consumer credit at interest. It’s not equivalent at all. Corruption in financial industries is what this article is discussing. If it’s a separate issue, I’m confused as to the point of talking about this at all! I don’t think your explanation is correct. Why wouldn’t I go directly to Jimmy in that case and cut out the middle man since he is offering no value add? The fact is, the middle man, Ben, in this case, believes that he can identify superior companies to invest his clients money in and earn a greater return. This is Ben’s value add and why he charges 1.25%. Golfer John is correct and that point, essentially, blows a hole in Ben’s thesis here that the financial sector adds no value because they only manage “existing resources”. Steering capital to the good ideas that improve consumer wealth and generate a return is a value add and the fact that millions of transactions like this happen voluntarily between consenting adults further supports this. Physics tells us that matter cannot be created or destroyed, so the same resources that are on this earth today are the same ones that were here 10,000 years ago. So, in that sense, Apple is simply managing “existing resources” when they build the iphone, Toyota simply managing “existing resources” when they build a car, and UPS and US Mail are merely moving “existing resources” from one location to another when they make deliveries, must be no value add there right? Asserting that the financial sector only manages existing resources, and then citing that as proof of no value add is simply a non sequiter. Law of conservation of energy states that the energy can neither be created nor destroyed but can be transformed from one form to another. That’s true in Newtonian physics, but atomic reactions such as fission, fusion, and radioactive decay conserve neither matter nor energy. John are you saying economics more closely quantum mechanics rather than classical? I suppose that could explain a lot of erratic and unpredictable behavior in markets! No, I wasn’t, though I have heard that. My theory of markets, and human group behavior in general, is a statistical approach. There are averages, distributions, and temporary equilibriums, but the interesting parts are the outliers. I guess that is more of a quantum flavor than Newtonian. Over time, economies behave cyclically. Much of nature and human group behavior is cyclical. Paul — That’s true, and a good analogy, except you’re getting a bit reductive with the term “existing resources”. I agree that “no value” is a bit extreme, which is why I became more interested in the -type- of value. John – My physics is flawed to the extent that the law of conservation of matter is flawed, this I admit. I am much more economist than physicist though so better that I get my physics wrong and econ right! I see a lot of similarities between the two, as well as crucial differences, but I don’t want to get too off topic. I agree, and as the absurdly hyperbolic title* of this article states, the author takes it to an even greater extreme – namely that the financial sector is actually a systematic destroyer of value (parasite) that is created by all of the other industries. The crux of his assertion rests on that they only “manage existing resources” and also calling Greg Mankiw an apologist, neither strikes me as an intellectually rigorous argument. And interestingly, on his own firm’s website, the author apparently contradicts the thesis of this article when advertising his financial services and the fees he charges for his own value add. I can think of several explanations for this, none of which are particularly flattering, others can draw their own conclusions. *a worse parasite than all of the murderous dictatorial regimes in human history that have institutionalized the slaughter and torture of millions? Really? I note this because it is so obviously false that it makes the rest of the content seem unserious and shallow even if valid points exist. Acidic comments tend to preach to the already converted, but perhaps that is the goal here. Yeah, ok. I should know better, Paul. My brain tried to rationalize the argument by making it less extreme. The goal probably was to mobilize the choir to go Occupy Wall Street for a few more months, haha. Those valid points shouldn’t be ignored because of the poorly handled hyperbole, though. The financial sector does have a great capacity to act as a parasite by overvaluing their services and squandering wealth generated by other industries instead of reinvesting it in worthwhile, valuable enterprises; or using that wealth to essentially ‘gamble’ or invent money that is not attached to any real value (i.e. shorting or credit default swaps). As the fruits of these behaviors are becoming obvious, it gets harder to justify policies that allow them to happen. In many ways that is my point. You found those “valid points” obviously correct before reading the article, so it rang true despite the extreme hyperbole. I did not find those points self-evidently true so this poorly constructed argument relying on clearly false assumptions struck me as uncompelling. For example, how does one “overvalue their services”? If one charges too much, no one is forced to buy. I may find Ben’s management fee of 1.25% to be overvaluing himself, but I have the option of not paying and instead going to less expensive alternatives. Why wouldn’t the financial industry invest in “worthwhile valuable enterprises” if they provide a worthwhile return? After all, aren’t they driven by an insatiable desire for profit? Who determines what enterprises are worthwhile? I do not see anything inherently wrong with short selling. Indeed, the ability to short a stock is simply expressing a view about its value, and leads to greater and more accurate price discovery. What is wrong with shorting a stock if one believes it is overpriced relative to its instrinsic value? Is it not preferable that prices reflect underlying economic fundamentals rather than being disconnected from such? Shorting puts downward pressure on prices, and helps prevent overvaluation. Credit Default Swaps are nothing more than insurance against a bond default. There is nothing inherently wrong with insurance. I’m not suggesting that you, here in the comments, need to write a paper elaborating on those, just that this article did a poor job of pursuading, though again, I am coming to the realization that I am likely not the intended audience. This discussion in the comments has actually been more fruitful than the article itself. This argument hinges on everyone that purchases these services knowing their true value. It’s very simplistic to say that if someone purchases it, that is the real value. It gets complicated when you take into account the psychological pressures of purchasing behavior, such as “middle-price” preferences, “money you don’t see is money you don’t miss” and other tricks that are employed to get people to pay higher prices. Countless services and products we rely on were funded by taxes to make them profitable. They are “worthwhile” but apparently not “profitable” enough to invest in. Making money and creating value aren’t the same thing. Ideally, everyone decides what is worthwhile. Shorting is basically a bucket shop in disguise. Agreed. And I could write a paper elaborating on this! In a literal sense, you are correct, it is an imperfect measure of value. However, I think it is far and away the most reliable one we have as value is extremely subjective. I don’t think it is right or prudent for third, non cost bearing parties to preempt decisions made by consenting adults, rather, I would accord them the dignity of free choice. There are many things that consumers purchase that I do not understand, why anyone would pay a premium for a fast car seems like a waste of money to me, for example. Why anyone would pay money to golf, not to mention the huge cost in terms of time it takes to get through 18 holes, seems like a waste of money to me. These are things that make no sense to me because I do not see the value there. But, I recognize that people have various tastes and preferences, and I respect that and presume that individuals know themselves and their own tastes and preferences better than I (or someone else) does. Therefore, when someone values something that I do not understand, I tend to believe it is a result of a difference in preference, rather than they are too dumb to figure out what they like, or that they are “tricked” into buying something and hence need protection delivered by those who fancy themselves as enlightened enough to see the real truth. Nothing about this is unique to the financial industry, by the way. Apparently not enough people decided these services and products were worthwhile, so politicians decided they were worthwhile and used the force and power of government to get them done. Substituting preferences of politicians, spending other people’s money for those of millions of individuals spending their own money does not seem like an efficient way to allocate resources. I agree with you on purchasing decisions. People should be free to determine value. I’m not saying people are always dumb, but I do think they are manipulated. If you want to believe they are not, that is up to you, but apparently you’ve never seen advertising. The financial industry advertises itself heavily, especially in consumer credit markets and insurance. But if we’re going to gauge something as nebulous as “true value”, it requires a level of conscientiousness from everyone, and accepting whatever people purchase as reflecting it’s actual value is a quick way to guarantee abuse, especially when you have something like consumer credit. If people are free to determine value, they should also be held to the consequences of their choices, which is currently not the case in the financial industry and increasingly in the general population. You mean like electricity, phone services, railroads, airlines, fortified wheat, water treatment, the internet, satellites, healthcare.. the list could go on and on. It is less efficient (a word that really needs to be defined clearly, but I’ll assume I know what you mean! ), and it happens because otherwise it wouldn’t be possible, and yet it becomes widely adopted and lauded none-the-less; progress, they say. Like I said, worthwhile and profitable are not 1-to-1 correlation, just as willingness to purchase doesn’t necessarily indicate true value. I thought you might have some interesting opinion on the CDS as money creation… I’m still trying to figure that one out!